"The power of rice husk,a low-cost technology solution to generate power using rice husk has been developed by a small-scale unit based in Tanuku, Andhra Pradesh. This will help meet the power demand of rice mills, which dot several Indian villages." The rice husk gasifier was fabricated by Associated Engineering Works, a Tanuku-based company which helps develop renewable energy sources. Three years of research and development went which won for the company the 1999 R&D award presented annually by the Department of Scientific and Industrial Research (DSIR) and FICCI. Gasification is an alternate energy based technology which allows for the conversion of biomass such as rice husk into suitable geseous fuel. The resultant gas can then by used for generating electricity. It is estimated that a typical rice mill requires a power backup of about 80-100 kw. With rice husk, a byproduct which accounts for 20 per cent of the paddy, the raw material for a small-sized gasifier is easily available. Farmers normally use part of the husk for parboiling and drying paddy, and the rest is thrown out. The company was encouraged by a number of rice millers to take up an R&D project to develop a prototype version of a gasifier. The SSI, which allocates 5 per cent of its turnover to R&D, launched a programme in 1995 for the design and development of a cost-effective gasifier. Simplicity in operation, which means anyone, including a helper in the rice mill, could operate it without problems. A non-polluting, environment-friendly ash removal and disposal system. Centrifugal tar separators to remove tar and load husk easily. Continuous pneumatic husk feeding system. Since the company incorporated the necessary ecofriendly features, the net carbon dioxide emission is negligible, making the gasifier a good alternative to meet the growing power demands. The Ministry of Non-Conventional Energy Sources (MNES) has been funding initiatives in the development and design of technologies which make positive contribution to the environment. Biomass-based power projects fit the requirement, as the carbon dioxide emissions are claimed to be zero. 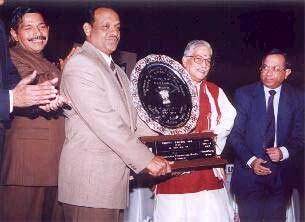 Managing Director of AEW Mr., G.M.Satyanarayana receiving National Award from Minister of Science & Technology, Govt. of India in 1999.